Perhaps one of the most highly anticipated hatch of this year, the new Hyundai i20 Fluidic was launched silently yesterday. After the launch of Sonata Fluidic following Union Budget, the launch of the next hatchback from Korean automakers Fluidic Sculpture design phenomena was imminent. Weeks ago, we had bought you the entire detail of the i20 facelift, and Hyundai Motors India Ltd. has launched the Fluidic hatchback at a starting price of Rs 4.73 lacs, which makes it cheaper than the predecessor. 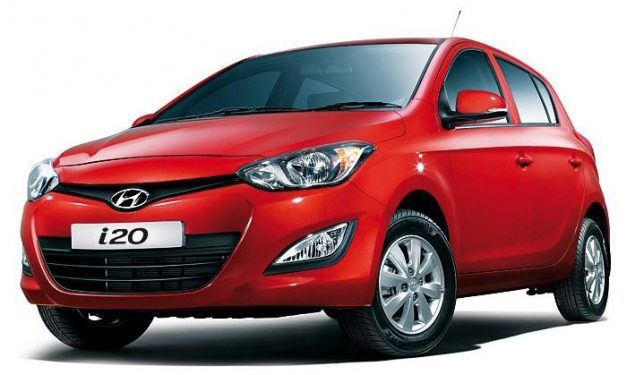 The Hyundai new i20 is bombarded with the Fluidic design throughout the body. From the pictures, you can make out the headlights receiving sleeker and more aggressive look, while the LED looks great. Foglamp also gets heavily redesigned, the grille gets a wider chin and the hood is more aggressive, while shorter in length. On the rear, the tail-lamps are reworked with the rear windshield featuring dark ambience. There is also redesigned bumper that sit higher from the ground and a reverse camera is sported on the boot. Previously seen five-spoke wheel is dumped for a restyled 8-spoke alloy. Going along with the sporty appeal are roof spoiler, wider grille and RVM incorporated indicator lights. No significant update is done to the interiors, with just minor tweaks to the AC vents, driver seat armrest, cluster ionizer and re-toned dashboard. As we had speculated, the Hyundai i20 Fluidic gets a Variable Valve Timing on the 1.2-litre petrol engine borrowed from the current version, that spits out 84 bhp. There is also the option of 1.4-litre diesel giving 90 bhp and the 1.4-litre petrol automatic giving 100 bhp. Mated to the 1.4-litre diesel is a 6-speed manual gearbox. Moreover, the i20 Fluidic features improved noise vibration harshness (NVH) figures making the ride smoother than before. It also boasts a remarkable fuel-economy. According to Automotive Research Association of India (ARAI), the VTVT 1.2-litre Kappa delivers 18.5 kmpl, the 1.4-litre CRDi delivers 21.9 kmpl and the 1.4-litre petrol automatic gives 15 kmpl. Competing against premium class hatches, the Hyundai i20 Fluidic is loaded with top-notch functions like rear camera for parking, electro-chromic mirror with anti-glare function, heated outside RVM, keyless entry, rain sensing wipers and an updated audio entertainment system. Talking of safety, the Hyundai Fluidic hatch is sported with all four disc brakes and ABS. There are 6 airbags, clutch lock system and smart pedal system, which was never seen in a hatchback before. Hyundai has positioned the new i20 to battle in the premium hatch segment against the new Maruti Suzuki Swift, Nissan Micra, Volkswagen Polo, Fiat Punto and Skoda Fabia. Dubbed the iGen i20, the new Hyundai hatch is offered in 12 variants.